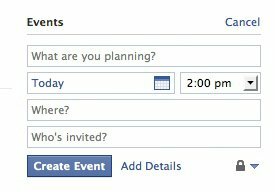 Feeling that Facebook events aren’t currently used enough for spontaneous events, the worlds largest social network has released a feature to make future plans easier to share. Events can now be created direct from an events box on your home page in a single step. Just type details into the ‘what are you planning’ field in the right column of your home page (if it’s not there just yet, give it some time, it’s being rolled out in phases). If this all sounds familiar, it’s because the feature is exactly what Plancast has been built its entire business plan upon, sharing future plans. Whether this is game-over for the SF based startup, we’ll have to see, but needless to say – this is a massive blow to a company that has received a great deal of hype over the last few months. Interestingly, Plancast was Facebook’s fbFund ’09 initial winners where they received a micro-seed round of funding.